The CleanFinancial guide to CAD/CHF spread betting. Where Can I Trade CAD/CHF for Free? How to Spread Bet on CAD/CHF? The live contracts for difference chart below offers you a helpful guide to the CAD/CHF FX rate. The above Plus 500 chart usually shows the near-term CAD/CHF futures contract. Should you want to access real time spread trading charts/prices for CAD/CHF, you will normally require a financial spread betting account. You can also use a spreads account to trade shorter term spot markets. Readers should note that opening any such account is subject to suitability, status and credit checks. If your new account is accepted then, once logged on, you will be able to access the real time trading prices/charts. These are usually provided as part of the service. The catch is that you could receive an occasional sales email or call from your chosen spread betting firm. If you were to trade then, before starting, remember that financial spread betting and CFD trading do involve a high degree of risk to your capital and you can lose more than your initial deposit. Users should note that you might also be able to spread bet on CAD/CHF through other platforms. CAD/CHF is currently trading at SFr 0.73288. At the end of the last session, the market closed -SFr 0.00354 (-0.48%) lower at SFr 0.73185. The forex market is above the 20 period MA of SFr 0.73236 and below the 50 period MA of SFr 0.73385. The forex pair is currently above the 20 day MA of SFr 0.73109 and below the 50 day MA of SFr 0.73973. CAD/CHF is currently trading at SFr 0.78055. In the last session, the market closed -SFr 0.00030 (-0.04%) lower at SFr 0.77980. The forex pair is trading above the 20-period MA of SFr 0.78002 and above the 50-period MA of SFr 0.77996. The market is trading below the 20-day MA of SFr 0.78150 and above the 50-day MA of SFr 0.77595. Advert: CAD/CHF Spread Betting, sponsored by FinancialSpreads.com. You can spread bet on CAD/CHF with Financial Spreads. Investing does involve risk, however, if you would like to try a Practice Account, that lets you try out spread trading and access professional charts, see below for more details. When considering which investment option is right for you, don’t forget that spread trading in the UK is currently tax free*, i.e. it is exempt from income tax, capital gains tax and stamp duty. All of the above firms offer a free Practice Account which lets users practice with an array of orders, analyse professional level charts and test trading strategies. 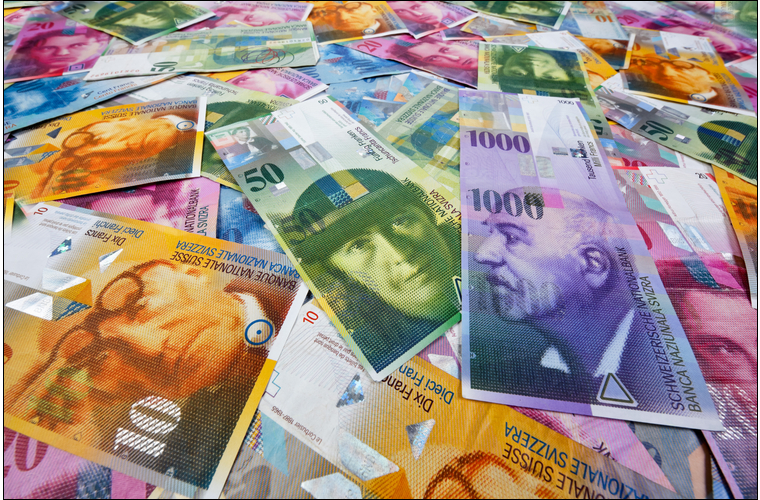 As with a wide variety of global markets, investors can spread bet on forex rates, like CAD/CHF, to go up or down. When spread betting on CAD/CHF you trade in £x per point where a point is SFr 0.00010 of the pairs movement. So, if you risked £4 per point and CAD/CHF moves 30.0 points then there would be a difference to your P&L of £120. £4 per point x SFr 0.00300 = £4 per point x 30.0 points = £120. An important aspect of this Rolling Daily Market is that unlike a normal futures market, there is no closing date. Should your trade be left open at the end of the trading day, it just rolls over into the next session. Should your forex spread bet roll over then you usually pay a small overnight financing fee. You can learn more in our feature Rolling Daily Spread Betting. Then you could go long of the market at SFr 0.96623 for a stake of, for example, £3 per point. So, you make a profit of £3 for every point (SFr 0.00010) that the CAD/CHF pair pushes higher than SFr 0.96623. Conversely, however, you will make a loss of £3 for every point that the CAD/CHF market decreases below SFr 0.96623. Put another way, if you buy a spread bet then your P&L is found by taking the difference between the settlement price of the market and the price you bought the spread at. You then multiply that price difference by the stake. As a result, if after a few days the currency rate started to increase then you might think about closing your spread bet so that you can guarantee your profit. 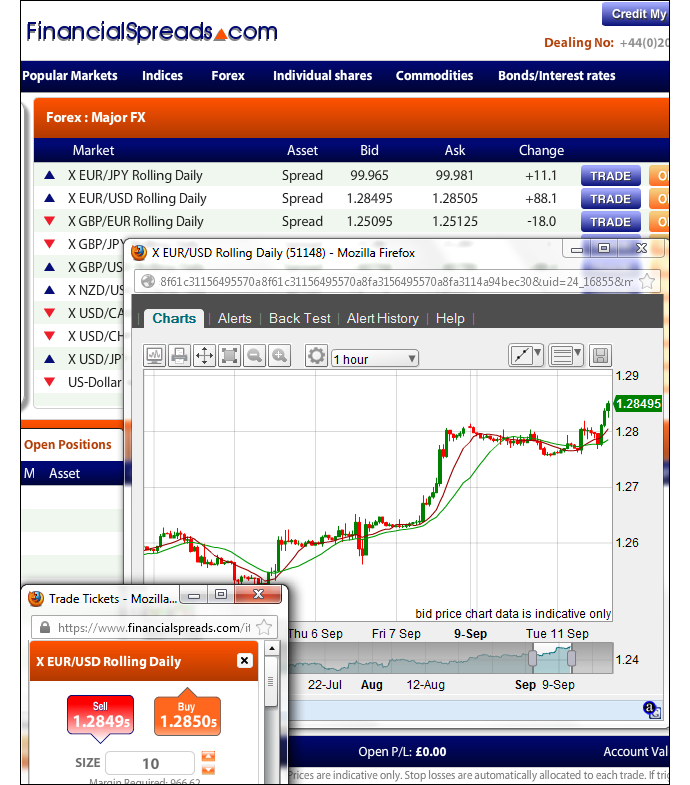 Trading forex, by spread betting or otherwise, is not always straightforward. In this example, you had bet that the FX pair would increase. Naturally, the forex rate can also decrease. If the CAD/CHF market dropped then you could close your position in order to restrict your losses. Note – CAD/CHF Rolling Daily currency market quoted as of 11-Sep-12. Whilst financial spread betting on Canadian Dollar – Swiss Franc you trade in £x per point where a point is SFr 0.00010 of the pairs movement. So, should you choose to risk £4 per point and Canadian Dollar – Swiss Franc moves 25.0 points then that would change your P&L by £100. £4 per point x SFr 0.00250 = £4 per point x 25.0 points = £100. Then you may go long of the market at SFr 0.95237 for a stake of £2 per point. So, you gain £2 for every point (SFr 0.00010) that the Canadian Dollar – Swiss Franc pair moves higher than SFr 0.95237. Having said that, it also means that you will lose £2 for every point that the Canadian Dollar – Swiss Franc market falls below SFr 0.95237. Looking at this from another angle, if you buy a spread bet then your P&L is found by taking the difference between the settlement price of the market and the initial price you bought the market at. You then multiply that difference in price by the stake. With this in mind, if after a few trading sessions the forex pair rose then you might consider closing your spread bet so that you can lock in your profit. Financial spread trading is not simple. In the above example, you had bet that the forex pair would increase. Naturally, the FX rate can also decrease. If the Canadian Dollar – Swiss Franc rate had started to fall then you could choose to close your position in order to limit your losses. Note – Canadian Dollar – Swiss Franc Rolling Daily spread accurate as of 18-Sep-12.